Are you in need of a new dog collar? 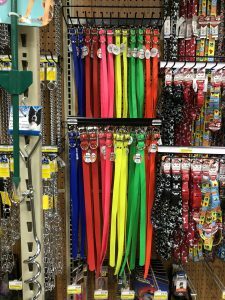 Argyle Feed Store just got a brand new stock of dog collars and leashes just in time for those long summer walks. We have a large selection of new collars to choose from and from brands you know like Coastal Pet, Biothane, Nite Ize and more. It is important to fit your dog with the right collar and leash that fits their size. Also, it’s important to think about the type of activity you will be doing with your dog. For example, if you plan to train your dog you need a good training collar and leash like the ones made by Coastal Pet called Titan. If you plan on getting your exercise in and do some power walking then there are special retractable leashes that would be comfortable for both you and your dog during these types of vigorous activities. Small dogs have their own special needs when it comes to providing a good harness and leash. How about those midnight walks and runs after work? You will need an LED collar and leash like those made from Nite Ize. If style is your thing then look no further we carry printed collars and leash that customize to your personal style and fashion with so many prints to choose from. No matter the activity it is always good to check and keep your collars and leashes new. Stop by Argyle’s today and check out our selection. This entry was posted on Friday, June 22nd, 2018 at 1:22 pm	and is filed under Dog, News & Updates. You can follow any responses to this entry through the RSS 2.0 feed. Both comments and pings are currently closed.